Are you looking for a whole-foods plant-based butternut squash galette recipe? I couldn’t find one, so I created this for us to enjoy. This vegan galette recipe has butternut squash, sliced and roasted, then layered beautifully over a soft filling made from food processing, or blending a fennel bulb (or dried fennel), crabapples (or regular apples), extra firm tofu, and yummy sage, rosemary, nutmeg and other fall flavours. All snugly embraced in a galette dough pouch, for a cozy harvest meal. Whole-wheat whole-grain flour, almond flour (healthy unprocessed fat, replaces margarine), non-dairy milk, nutritional yeast, and some seasonings. Made in a food processor. The dough is easy to handle, rolls out fine, but was a little tough right out of the oven – due to lack of oil I expect, and potentially I cooked it too long. The pastry softened up in the fridge and was nicely tender as leftovers. Next time I’ll blend 3-4 dried prunes into the dough for moisture. BUT I haven’t tested prunes in the galette dough yet. I’m posting the version I did test, next time I’ll add prunes and update the ingredients. Think of a galette as a lazy pie, or a lazy quiche. I was surprised how easy it was to roll out the dough, spread the ingredients on it, wrap it gently and pop it back in the oven. I used a large oven safe wok, which shaped the sides nicely. An extra-large skillet would also work, as would a baking sheet. We got easy to pack galette leftovers, perfect for school and work lunches. I can see how little mini galettes would make great individual servings. This galette is wonderful at the end of summer, since you make it with autumn harvest vegetables, helping you use up that butternut squash on your counter. With butternut squash, and a savoury tofu filling with fennel, and crabapples (or regular apples), this galette is simple, satisfying, and a great way to use up food harvested from your backyard. The soft creamy tofu filling is delicate and tasty, the pastry complements the ingredients well. Butternut squash is the perfect not too sweet, firm colourful topping. Let this vegan galette cool slightly before slicing and serving. Preheat the oven to 400°F. Take out an extra-large oven-proof skillet with high sides or a wok. A baking sheet can work too. Peel the entire squash, you can roll and peel lengthwise. Then cut the squash into two pieces to separate the bottom rounder part from the narrower top section. Cut both parts in half and remove any seeds. Cut all four pieces into 1/4-inch-thick slices. Core and slice the apples, slice the fennel into small pieces (it will be food processed anyways). Note: if you are short on time, you could add the apples raw to the filling in the food processor instead of baking. Spread sliced squash, apples, and fennel on baking sheets. Place the apples and fennel together, you will scoop them up with a spatula to move to the food processor. I didn't line or oil my sheets, some of the squash edges stuck, but was easy to scrape off. Bake until the squash, apples, and fennel are tender, about 25-30 minutes. While the squash is baking, put the flour, almond flour, nutritional yeast (if using), and salt in a food processor. Pulse to combine. Add 1/3 cup of the non-dairy milk, process, it should still be floury. Add additional non-dairy milk, 1 tablespoon at a time, until the dough sticks together (to test, remove the top and gather the dough in your fingers. If it sticks together without crumbling, it’s ready). I ended up using another full 1/3 cup of milk. Be careful not to over mix once it is doughy, it makes it tough. Soak or clean the food processor, you will need it again to finish the filling. Transfer dough to a lightly floured board or counter, and shape the dough into a disk. With a rolling pin, roll out the dough into a very large circle about 1/4-inch thick. Transfer dough into the large skillet, baking sheet, or wok, let the dough hang over the edges if necessary, you will fold it over the ingredients. Add extra firm tofu, sage, rosemary, salt, nutmeg, pepper and lemon juice to the food processor. You could also add the apples raw at this stage if you chose not to bake them, say maybe because you ran out of time to slice them :o. When the vegetables are done baking, scoop the apples and fennel with a spatula and add them to the food processor with the extra firm tofu. It's fine/better if they are still hot. Blend until well mixed. Taste test and adjust seasonings. Spread the apple-tofu (ricotta) mixture over the top of the pastry, leaving a 1-inch border. Arrange the squash prettily, in a spiral pattern, over the apple-fennel-tofu-ricotta mixture and fold the edges of the pastry toward the center of the galette. Sprinkle almond flour, garlic powder and salt over the center of the galette and optionally onto the crust. Bake until the crust is crisp and golden brown, about 20-25 minutes. Let cool slightly before slicing and serving. Serve with a bright green salad, also goes well with steamed brussels sprouts. 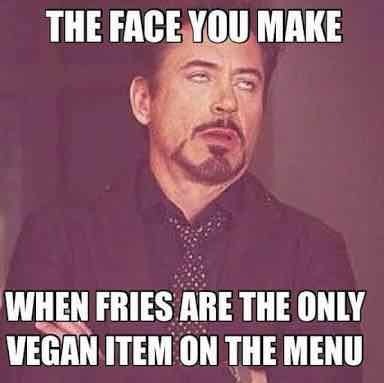 FOLLOW and SUBSCRIBE to VeganEnvy.com on Pinterest, Twitter, Instagram, YouTube, and Facebook! Get FREE healthy vegan information and recipes! Get surrounded by vegan LOVE. Please, help others, and our planet – share this content on social media! Toss broccoli in a vegan and gluten-free mixture of tahini, lemon juice, minced garlic, soy sauce, and pepper, then bake for 10 minutes. It’s crispy and creamy at the same time. Tired of steamed and boiled broccoli? Try crisping your broccoli in the oven. It’s a very fast and simple way to make broccoli interesting as a side dish. Whole-foods plant-based vegetables done right. A lemon garlic infused side dish, broccoli with a citrus twist. Add some hot sauce for fun! SERVE WITH: Lazy Vegan Frittata – minus the spinach and peas. Broccoli roasted with tahini, garlic, and lemon becomes crispy and creamy. I loved how quick and easy this was to make, and also how delicious it was. I recommend this recipe for someone searching for a more interesting take on roasted broccoli. Try serving with my Lazy Vegan Frittata - minus the spinach and peas. Place all of the ingredients except for the broccoli in a large bowl and whisk to combine. Add broccoli and toss well to thoroughly coat. Scatter on a sheet pan and bake for 10 minutes. Serve hot for best flavor, squeezing a little extra lemon juice on top. Goes great with Lazy Vegan Frittata. In case you don't have tahini in the refrigerator, I think that miso and Sriracha, or peanut butter would be good, too. Oh acorn squash – how I thought you were disgusting when I was a child, and, now I know what it takes to make you delicious! Many adults aren’t squash fans, probably because their family didn’t serve it very well. This recipe can change all that. Most people don’t know how to stuff vegetables, do they? The ones I know anyways, are wowed when presented with a flavourful rice filled acorn squash. No need to be impressed folks, because this stuffed acorn squash recipe is a dead easy meal to make. Downright relaxing for the cook actually. This whole-foods plant-based (wpb) oil-free roasted and stuffed acorn squash is extra deliciously complex, because the whole grain wild rice (any nice healthy whole grain rice should do) has extra scrumptious dried cranberry bits in it, plus the east Indian dessert pepper spice Garam Masala. You can buy Garam Masala in the ethnic section of your grocery store. I have a large bag of it, it goes nicely with fruit as well, like apple slices before bed, or on oatmeal. Garam masala, cranberries, and acorn squash are a great combo. Very romantic. Plus, I’ve stirred some spinach ribbons, and optionally black beans, through this sticky sweet, spicy, rice, making things very much more interesting. Can You Eat the Skin of Acorn Squash? I looked it up and people said that the skin of acorn squash is edible if cooked long enough, so I announced this to my family, when serving them, they promptly all said “no thanks”. Then I proceeded to try some of the skin on my squash, spit it out, and declared it was much too tough. “Told you so” my husband said. I would not encourage others to enjoy eating the skin. FODMAP rating – without the black beans this recipe is Low FODMAP. With the black beans, be sure to used canned, eat 1/4 cup or less of the canned beans and it is moderate FODMAP. Stuffed acorn squash presents well at any family gathering or dinner party, such as Thanksgiving, Christmas and Easter. The warm, peppery and sweet seasonings pair perfectly with fall and winter weather. I can't over-emphasize how easy this dish is to make, but makes you look like a fairly accomplished cook. As long as you have time to cook rice, it will come together 5 minutes after the rice is done. This vegan no-fat version has dried cranberries, rice, spinach and optionally black beans, so it can easily serve as your entire meal. Add rice, water, salt, garam masala and cranberries to a pot on high heat. Bring to a boil, immediately reduce to low simmer, and cook for 45 minutes, or as per rice package instructions. Check and stir often, to prevent the cranberries from burning. If the rice is not soft once the water is gone, add more water and cook longer. The dried cranberries can absorb liquid the rice needs. Break stem off acorn squashes (if there is one). Cut in halves. Scoop out the seeds and strings. Sprinkle with pepper and salt, place cut side down on a baking sheet and bake for 30 - 45 minutes (timing will depend on the size of the squash). Once the rice is done, turn off the heat. Stir chopped spinach into the rice so it 'melts'. If using, drain and rinse black beans, add to rice mixture. Let sit for a few minutes to warm the beans. Once done, remove acorn squash from the oven. The squash should be soft all the way through. Spoon spinach, black bean, cranberry, rice mixture into squash, you should be able to pile it quite high, serve warm. Omit the black beans to make this recipe a side dish. Goes well with lentil loaf at holidays. Cut large squash into quarters before serving. I’d never made polenta from scratch before. Have you? I didn’t know you could make a vegan, fat-free, polenta (think corn porridge!) using cornmeal, for dinner, and that it would only take 15 – 20 minutes. It’s really easy and very yummy when you add some seasonings and zucchini to it. The zucchini keeps it moist and stops it from hardening as much, as it cools. Cornmeal polenta is faster than pasta, easier than potatoes, speedier than quinoa, quicker than rice, and seriously lip smacking good. If you do know how to make polenta, then you probably agree, making creamy vegan cornmeal polenta is really easy, and naturally tastes great as a no-oil gluten-free whole-grain plant-based quick easy vegan side-dish. Boil water, add seasonings and extras (if any), add cornmeal, wait a few minutes, done! My kids probably would have preferred if I left out the seasonings and extras. But… I still had 4 zucchini squash from my neighbours and aunt taking up most of my counter ledge. Must. Use. More. Zucchini. Autumn harvest and all. So I created this shredded zucchini polenta recipe that turned out wonderfully. Boil water, food process a generous sized zucchini (mine made 4 cups), add salt, Italian seasonings like oregano, and rosemary, with generous pepper, add zucchini to the water, stir in cornmeal, wait 5 minutes, voila! Savoury, vegan, fat-free, gluten-free, low FODMAP (for us folks with IBS), Italian style polenta. My kids were disappointed that the polenta had the seasonings, and the green bits of zucchini skin. If you are feeding vegan children who are picky about mixed in green things, like mine, I would suggest you peel the zucchini and make the polenta with just salt, pull the kids portions out, then quickly add remaining seasonings for the non picky eaters. Serve broccoli or something else green on the side, full transparency kids. I say quickly, because cornmeal thickens up real fast in boiling water, I was very surprised, and pleased by this. It is why I suggest adding the spices before the cornmeal in the recipe below, otherwise it is tricky to stir them into the thickness. I ended up with lumps, and discovered they are very tasty, so don’t worry about those. What a great easy carb for a supper on a busy night. Polenta weekly from now on?! The polenta is such a comforting texture when it is warm, like thick porridge, but more smooth, sophisticated, and appropriate for dinner. Is this what grits are? I really don’t know. As soon as I find out, I will share my knowledge with you, it’s my mission. To make vegan families the norm. FODMAP rating – low FODMAP. For people with IBS, no onions in this dish, and cornmeal is low fodmap, yay! Take water, a bag of cornmeal, a zucchini, oregano, rosemary, salt and pepper and turn it into a filling, lip smacking, yummy, warm, vegan comfort food, that comes together so fast and tastes wonderful. Whole-grains, gluten-free, plant-based, no-oil. Tastes a bit like thanksgiving. Use a food processor to prepare the zucchini, peel it first if serving picky children, throw it in some boiling water with the seasonings, add cornmeal, stir and wait 5 minutes for the cornmeal to cook. Very simple. Very cozy. Very smooth and full of taste. Great recipe to try on a night you are running late and looking for a fast, easy, simple, vegan carb/starch side-dish for your supper. 6.5 cups zucchini approximate, shredded in food processor, or grated. One large zucchini. Grate or food process zucchini. Peel first if serving to picky children, or picky adults. Add zucchini and water to a large saucepan, stir to combine and bring to a boil. Add salt, pepper, oregano, rosemary, and nutritional yeast, if using. With water / zucchini and spices bubbling, add cornmeal in a thin stream, stirring with a wooden spoon to incorporate. Turn heat to low. Keep stirring over low heat for at least 5 minutes as the cornmeal cooks and loses it's raw taste. It thickens into polenta very quickly, which is why it is important to have the seasonings in the liquid before the cornmeal. Otherwise it is tricky to stir it all together. Taste test (blow on it, don't burn your tongue!) and adjust seasonings to your preference. After the cornmeal has been cooking, it should get thick, turn off heat, let it sit 5 more minutes, then it should be ready to serve. The longer the polenta sits, the thicker it will get and the herbs will mellow out. Oregano can be quite strong, I find it tastes better the longer it sits, and is really nice as leftovers. Snip green onions or chives overtop when serving, some people like this with freshly squeezed lemon as well, or cranberry sauce. Stir in black beans before serving if you are looking to add a vegan protein. carrots sautéed in water, add spinach and fresh dill when carrots are almost done. kidney beans or chickpeas and canned mushrooms microwaved in a steamer dish, seasoned with cumin or chili powder and freshly squeezed lemon. a nice dark leafy greens salad. Use up fresh green tomatoes in this creamy avocado, edamame, chickpea, whole-foods plant-based green goddess recipe. Put it on rice, quinoa, or other grains with some greens, like a bed of spinach. No-oil needed, it’s fat-free but full of natural omega fats to keep your body glowing. Also try smashing this green spread on toast or as a filling in a lettuce wrap. Hard to go wrong, and very easy to go right, with avocado and edamame, some frozen peas, and optionally green tomatoes. Create yourself a super vegan creamy mixture and delight. FODMAP rating – medium low amount of FODMAPS. Monash recommends eating less than 1/4 cup of chickpeas, and less than 1/4 cup of thawed peas in a sitting. If you proportion more grains and spinach and less of the filling, IBS sufferers should be able to enjoy this recipe. This has a green goddess appeal when you use green tomatoes fresh from your garden or local farmer's market. Fresh and green, with creamy avocado, edamame, the tomatoes add a light citrus. Red tomatoes also work, or omit the tomatoes. On toast, on rice, in a lettuce wrap how else can we use this delicious filling, spread and smash? Cook grains, I used a rice quinoa mix. Set aside to cool. Microwave edamame in a microwave steamer to cook, as per package directions. Usually 5 minutes. Add avocado, drained chickpeas, green tomatoes, salt, and dijon mustard to a medium/large bowl. Taste and adjust amount of mustard to your preference. Add edamame to the bowl. Mine were in their shells still, so I microwaved them in their steamer bag and then shelled them into the bowl. Mash with potato masher until desired consistency. Stir in frozen peas, still frozen, they will cool it down and then you don't need to refrigerate. Line a bowl or plate with fresh baby spinach or romaine lettuce. Add rice/grains, and then the edamame, avocado, chickpea mix. Top with sliced red peppers, use scissors to cut green onions on top. Being able to make a quick healthy vegan gravy will expand your plant-based cooking options. Not only is it delicious, but gravy can serve as the protein for your meal. Look how much iron is in one serving of this gravy, and it contains 28% of your daily protein needs too, with zero fat and cholesterol. This smooth, brown, thick gravy reminds us of Thanksgiving dinners and stuffing, and good times at family gatherings. It is the perfect traditional brown gravy colour and has savoury flavour. In under 10 minutes you can make smooth, perfect, plant-based, fat-free gravy, in the microwave. You will get almost 4 cups, of smooth warm lump-free gravy. I like to blend most of the lentils into this vegan gravy, and serve the rest of the lentils whole on the plate, or stirred into the gravy so people see they are getting legumes too. If you are using this gravy as the protein of your meal, one 540ml can of lentils for every 2 people should ensure there is enough gravy and lentils for everyone. This gravy recipe is also the sauce for my Green Bean Casserole, a classic and very tasty Thanksgiving type side dish. 1/4 tsp poultry seasoning Adjust the seasonings to your taste. This amount makes for a mild flavour. Add water to a 5 cup or larger microwave safe bowl that is large enough to handle a hand blender. I use a glass Pampered Chef 4 cup batter bowl because it has a rim to prevent boil-overs, a lid for storing, and a spout. Whisk in the cornstarch, poultry seasoning, salt, optional onion powder, optional nutritional yeast, and pepper so there are no lumps in the water. Microwave for 2 minutes, whisk to combine well, microwave for 2 more minutes, whisk. Your gravy should be fairly thick at this point. Microwave longer if it isn't yet in one minute increments. Microwave power varies. Stir in 1 1/2 cans (770ml) of the drained lentils, reserve 1/2 can of lentils. Blend with a hand blender until smooth. Taste and adjust seasonings to your preference. If you have a large enough bowl, stir half of the set-aside lentils right into the gravy. I like to reserve some plain lentils for anyone (small daughter!) who declines gravy, so they can still have lentils. Microwave 1 minute, stir and test the temperature. Add gravy to a gravy boat, and serve hot. Spoon reserved lentils on or beside the mashed potatoes, people can pour gravy over top. sage, rosemary, parsley, celery powder, seasoned salt, marjoram, thyme. Spoon the lentils onto or near your mashed potatoes, and pour hot gravy overtop. goes great with steamed vegetables - like broccoli and carrots, brussels sprouts, with a cob of corn as well as something green. It's been a real hit. Stir leftover lentils into the gravy for the next day. Easy, moist, fudgy, VEGAN, whole-foods, gluten-free, BEAN brownies. Use white beans, cocoa powder, blended oats, dates, and fruit, in a food-processor, for perfect, chocolate, healthy, rich, brownies everyone will love. FAT-FREE, HIGH FIBER, HEALTHY, DAIRY-FREE, EGG-FREE, AWESOME! This SMOKY VEGAN CHILI recipe LOOKS LIKE IT HAS MEAT, but tastes even better. TAKE THIS TO A PARTY, it is so good, with the best chili spices recipe. EASY, DAIRY-FREE CREAM OF CAULIFLOWER soup WITH SILKEN TOFU AND POTATOES. Make in 45 MIN. Healthy vegan dinner, without oil. Whole foods, plant based, so nutritious! If you would like to have a DAIRY-FREE VEGAN WHITE SAUCE for your PASTA, or maybe you are trying to LOSE WEIGHT – here is a WHITE BEAN PESTO SAUCE, it’s a HEALTHY WHOLE-FOOD PLANT-BASED, CREAMY, FAT-FREE recipe. This dairy-free no-oil healthy dressing will make your vegan coleslaw shine! With dates, tofu, rice vinegar, lemon and pecans it is also going to keep you from getting hungry. Whole-foods plant-based Butternut Squash Galette with no-oil. Whole-wheat pastry made with almond flour. Delicious creamy tofu filling with sage, fennel, and apple. Fast and easy delicious vegan parmesan cheese replacement uses nuts, garlic, and nutritional yeast. It is the best dairy-free, and lactose-free cheese sprinkle substitute I have found. 15 min easy AWESOME healthy Indian SPINACH side dish recipe using FROZEN OR FRESH, fast FAT-FREE vegan dinner idea, DAIRY-FREE, tofu paneer substitute/replacement, cook eggplant, tasty onion, fresh tomato, garlic, ginger, SPICES. Serve meal with rice or potatoes. Make FAST, FAT-FREE, WHOLE WHEAT FLOUR, HEALTHY, NO-RISE, VEGAN PIZZA DOUGH, in your food processor. Perfect, crispy and soft. Roll out, place toppings, and bake in 10 minutes. Fat-free, healthy, moist, no-oil, THE BEST. KIDS LOVE THIS CRUST! Our family’s FAVOURITE VEGAN green vegetable medley DINNER SOUP with PASTA, a wonderful meal soup – combination of green peppers, zucchini, SPINACH, corn and black beans, with basil and oregano, in a hearty, whole foods, no oil, vegetarian dinner soup. Fat free. Pears make a delicious healthy vegan fruit crumble when baked with oats, almond flour and ground cashews. Try this TASTY whole-foods plant-based kid friendly fat-free no-oil recipe with a ginger lemon twist! HEALTHY FAT-FREE EASY VEGAN CAESAR SALAD with croutons. The ZESTY garlic, and BRIGHT lemon FLAVOURS SHINE in this RECIPE, that is what makes Caesar dressing taste awesome. GARLIC AND LEMON! COLORFUL sweet potatoes, MAPLE CHIPOTLE chickpeas or tofu, EARTHY mushrooms, VIBRANT greens, CREAMY avocado and a FIERY sauce makes for a SPICY and HEALTHFUL VEGAN MEAL BOWL IDEA! Turn a classic Thanksgiving green beans side dish, into a delicious low-fat dairy-free whole-foods vegan dish, with lentil gravy, crispy homemade croutons and perfectly cooked green beans. Apples, carrots, celery, cranberries, and cabbage are beautiful to look at and are a wonderful combination as well. Making coleslaw in the food processor is so fast and easy. Mix Avocado, Fresh Green Tomatoes, Chickpeas, and Edamame Beans for a Creamy Vegan Spread, or Rice Quinoa Salad Bowl. Whole-foods plant-based green goddess recipe. No-oil needed, it’s fat-free but full of natural omega fats to keep your body glowing. Healthy simple vegan whole-foods plant-based lasagna that kids and families love, with no-oil, it uses tofu and spinach as a quick and easy ricotta cheese substitute. It’s EASY to make VEGAN WAFFLES from a box mix. Follow these simple steps to healthy whole grain dairy-free and egg-free waffles. Healthy OIL-FREE vegan dressing with a SWEET ZING from green onions, apples, and dried cranberries. AWESOME on quinoa and lentils pilaff, and is delicious on BRUSSELS SPROUTS. Healthy Vegan Italian Tomato Pasta Sauce with Whole-Foods Plant-Based Protein and No-Oil. Modernize your marinara by using lentils and chickpeas in a no-oil meatless version that replaces traditional spaghetti sauce. HEALTHY VEGAN COMFORT FOOD. Vegan Lazy Frittata – Potatoes, Chickpeas, Tofu, Spinach, Peas, Mushrooms – combined in a OIL-FREE creamy mess that is satisfying, NUTRITIOUS, and delicious. FAST vegan meal – dinner recipe is 30 minutes to make. DELICIOUS VEGANSAUCE. SPICY CHIPOTLE OIL-FREE VEGAN MAYO! Spicy, smoky, dairy-free, eggless, egg-free, chipotle, HEALTHY, fat-free vegan mayo recipe. Vegan lentil and brown rice soup with tomatoes, basil, oregano, onion, garlic, thyme, and zucchini. So easy to make, and clean up, a one pot meal. Aromatic and delicious blend of complex flavours in a hearty and satisfying comforting soup. Ginger and turmeric have demonstrated significant impacts on reducing pain and inflammation in multiple studies, try them in a vegan green smoothie! This smooth, brown, fast, fat-free lentil based vegan gravy reminds us of Thanksgiving dinners, stuffing, and good times at family gatherings. A traditional brown gravy colour, with savoury flavour. Ready in 10 minutes, in the microwave. Bok choy, tofu, carrots, spaghettini noodles, and ginger combined, make an easy, quick, simple, and healthy hearty vegan soup recipe for dinner. REAL VEGANS EAT QUICHE! EASY eggless, dairy-free, baked, vegan brunch, breakfast or dinner casserole. Firm tofu as a vegan egg substitute, best healthy no crust, oil-free, egg-free, whole foods quiche, smells and looks and tastes wonderful. DELICIOUS, vegan, HEALTHY, sugar-free, DAIRY-FREE, smoothie recipe with COCOA POWDER, banana, dates, spinach, pineapple and soy milk or almond milk or other non-dairy milk. Cocoa powder is full of antioxidants and is iron rich. With PERFECT SEASONINGS, potatoes, barley, and carrots it’s a SO GOOD, fat-free VEGAN SPLIT-PEA SOUP. Better than what you ate as a child! Full of IRON AND VITAMIN A, HEALTHY WHOLE-FOOD PLANT-BASED recipe, LOSE WEIGHT, feel and LOOK FANTASTIC. Mmmmmm, a bag of cornmeal, a zucchini, oregano, rosemary, and salt and pepper turn into a filling, stick to your ribs, healthy vegan comfort food, tasty polenta plant-based, no-oil, side-dish, so fast, quick, and easy, and tastes wonderful. Best fast vegan dinner side-dish idea! Ready in 30 minutes, this colourful, healthy, vegan dinner salad has roasted sweet potatoes, regular potatoes, asparagus, black beans and a tangy lemon, dijon, green onion, dill dressing. It is a complete meal and will leave you and your loved ones feeling satisfied and full of energy to be your healthy best. PERFECT LITTLE CROWD PLEASERS, vegan and gluten free oat cookies, but packed with BIG PEANUT BUTTER FLAVOUR! Healthy, no-oil, fat-free, whole-foods plant-based easy fast coconut sugar. Deliciously complex, tasty, healthy baked, stuffed acorn squash. Cranberry rice and spinach stuffing, Garam Masala East Indian dessert peppery spice. UNIQUE! People think you need to coat OVEN FRIES in oil, but THEY DON’T KNOW… try this recipe and you will learn better. Moist heat escapes and ACTIVATES the seasonings, your fries will be CRISPY, oil-free and full of HEALTHY LOW CALORIE FLAVOUR. Dinner in 20 minutes. A fast oil free, whole foods vegan Pad Thai recipe with tofu, noodles, and a homemade sriracha sauce, using Epicure Spice mixes. Easy healthy plant-based fat free meal. FAST, CREAMY, DAIRY-FREE tofu pasta sauce recipe, with soft silken tofu as a milk substitute to make a high protein, nut free, low fat and tasty zucchini, tomato penne pasta sauce. Use Tofu and apple cider vinegar as a YOGURT SUBSTITUTE to make a dairy-free, no-oil, fat-free, healthy vegan dill and cucumber Greek Tzatziki dip that is refreshing and delicious. Fast HEALTHY best vegan fat-free PASTA SALAD with BLACK BEANS, corn, green onions, tomatoes, frozen peas and BLACK OLIVES. Low calorie, high vitamin C, HIGH IRON, so GOOD FOR YOU! Families and KIDS love to eat this whole-foods plant-based (wfpb) quick meal. RECOMMENDED PRINCIPLES of the VeganEnvy DIET AND LIFESTYLE – how to eat whole foods plant based healthy vegan without oil TO LOSE WEIGHT, stay skinny, have great skin, and be FULL OF ENERGY, and how to move to STOP BACK PAIN and keep your ENTIRE body feeling great. Looking for fast, simple, easy, and the best tofu recipe ideas for dinner? Here is a list of healthy, family friendly tofu recipes with soft, silken, medium, firm and extra firm tofu options that taste delicious, and are great healthy, no oil, vegan meals. Eating these tofu recipes will make you and your loved ones lose weight and fight disease – guaranteed. As an omnivore, my IBS symptoms included alternating diarrhea and constipation, acid indigestion, doctor’s tests, depression, stomach and intestinal pain, fatigue and weight loss. Fix, cure, and treat IBS with a whole-foods plant-based vegan diet, what to do if you still have IBS and you are vegan, or a vegan diet makes IBS worse, eat a low-FODMAP vegan diet to successfully treat IBS. Eating Nuts Daily Did Not Cause Weight Gain – It Caused Weight Loss! Trying to decide what kind of bread is healthiest to buy? What granola bar, cookie, snack food, or what pancake mix is best? Use these 2 tips to increase your resistance to diseases like cancer. Learn what to look for on the nutrition label. Why No Oil on a Whole Foods Plant-Based Diet? We haven’t used oil in our kitchen since 2013 and I recommend you don’t either, starting now. This post outlines the reasons. I created VeganEnvy to be a fun, relevant, engaging, social and helpful place for you to belong. Iodine – how much do you need and how should you get it? Everyone needs iodine, but it’s especially important for vegans. Find out how much iodine you need daily to prevent goiter/goitre and the best sources in foods. ALL YOUR TOFU QUESTIONS ANSWERED – learn about tofu taste, nutrition, what tofu is made of, protein content, fiber, benefits, controversy, GMO, soybeans, calories, fat, and is tofu healthy. Plus how to choose, buy, press, and prepare soft, silken, and firm tofu. One of my new behaviours in 2017 is to eat a salad for lunch or supper most days. When I do this, I stay slim and have more energy and need less sleep. How often do you eat salad? Plant-based doctors recommend we eat cruciferous vegetables like cabbage, broccoli, brussels sprouts or cauliflower daily to prevent cancer. Coleslaw is a tasty, refreshing and easy way to eat cabbage – a proven cancer fighting food. The dressing I recommend is my Creamy Coleslaw Vinaigrette. I have included the nutrition facts from the salad and the dressing for you to see. Coleslaw is great for picky eaters like kids, many kids like coleslaw plain without dressing. Try offering some plain to your kids (if you have any) or put some aside before you add the dressing. Coleslaw keeps for a long time in the fridge, it’s great for school and work lunches. Apples, carrots, celery, cranberries, and cabbage are beautiful to look at and are a wonderful combination as well. Making coleslaw in the food processor is so fast and easy. Only 100 calories per serving, and you are getting cruciferous vegetables (cabbage) which if you eat daily will greatly reduce your chances of getting cancer. I recommend my healthy sugar-free and oil-free vegan Creamy Coleslaw Vinaigrette dressing for this coleslaw. This dressing turns a salad into a sweet tasting but healthy treat! 4 cups chinese cabbage raw, shredded. Click link to view a picture of Chinese Cabbage. You can use regular green or red cabbage too. I used Chinese Cabbage because it is a bit softer to chew, and easier for me to digest raw. 1 cup dried cranberries or raisins, reduce to 1/2 cup for weight loss diets. Prepare Creamy Coleslaw Vinaigrette recipe. Slice unpeeled apples into chunks and add to food processor. Add to large salad bowl. Chop or food process cabbage and carrots. Slice and dice celery, I do celery by hand because of the strings not always doing well in the food processor. Add dried cranberries or raisins. Pour Creamy Coleslaw Vinaigrette dressing on salad, and stir to combine. Serve immediately, or refrigerate for 30 minutes first. Coleslaw keeps well for days in the fridge. What's Special About VeganEnvy Recipes? VeganEnvy recipes are easy, low-fat, whole-foods, plant-based and nutrition rich. Real food my family eats, and techniques we use to cook. high nutrient plants, including fruit, greens, beans, legumes, soy, spices, seeds and nuts. no tricks (I am not going to say a recipe is healthy if it isn't). I choose ingredients that are proven to prevent and reverse disease, based on scientific studies, such as those reviewed on nutritionfacts.org and findings published by whole-foods plant-based (WFPB) experts featured in the Forks Over Knives (FOK) and What the Health documentaries FOK trailer. Eating VeganEnvy recipes will make you lose weight, look better, feel better and live longer. PLUS spend your money to cruelty free food systems, cut your environmental impact, and likely increase your compassion for, and awareness of, lives other than your own. This sweet tasting dairy-free no-oil healthy dressing will make your vegan coleslaw shine! With dates, rice vinegar, tofu, lemon and pecans it is also going to keep you from getting hungry. Eat healthy unsaturated fats from whole nuts and not processed oil. How often can you say your salad dressing is high fibre and sugar-free? With this vinaigrette you can! A sweet and tangy egg-free, dairy-free, dressing made with tofu, rice vinegar, lemon, dates and pecans. Plant-based oil-free dressing that complements coleslaw and keeps you from getting hungry. Contains healthy fats from nuts rather than unhealthy fats from processed oils. I recommend my Cranberry Apple Coleslaw recipe to go with this dressing. 1/2 cup pecans optionally toasted - Toasting nuts like pecans results in a more intense flavor. You don't have to toast the pecans, but if you do, you are going to get a more intense and rich flavoured dressing. I recommend toasting, and it is really easier than you might think. Often I have the oven going anyways, and I just spread nuts on the sheet beside whatever else I am baking for a few minutes and then take them out again. Broil: Spread pecans in a single layer on a baking sheet. Place in oven under Broil in oven on the "broil" setting for 2 - 4 minutes to toast. Bake: Preheat oven to 350. Place in oven for 10 - 12 minutes. Skillet: Heat a pan to medium on the stovetop, add pecans. Stir for 3 - 5 minutes with a spoon continuously so they will cook evenly and not burn. Regardless of method, remove when they begin to smell toasty and turn dark. Do not burn. While pecans toast, add tofu, non-dairy milk, rice vinegar, dates, and lemon juice to a high speed blender. Add toasted pecans and blend. Pour over Cranberry Apple Coleslaw. Or other coleslaw of your choice. We eat this salad on days I have waited too long to start supper. If I want to feed my family food in 15 minutes, this will do! My kids favourite food is pasta, so they love it. Try this great no-oil whole-foods plant-based meal salad for a pot-luck, party, or BBQ. Get your plant-based protein from beans and whole grain pasta. People will ask you about the dressing, surprise them by saying “it’s only dried herbs and lemon!”. With frozen peas, cucumber, canned or frozen corn, green onions, tomatoes, whole grain pasta and black olives this simple vegan dinner salad is fast, fresh, and easy to put together. While the pasta cooks, gather the vegetables, stir them together, still frozen. Add the drained pasta and the heat cooks the peas a touch, the pasta cools, things get juicy, the dried herbs release flavour, and your meal is ready to serve in minutes. Why whole grain pasta? Read How To Judge the Healthiness of Grain Products to learn more about why whole grain pasta is going to help your gut microbiome, prevent cancer, and help you lose weight. Olives are better for you than olive oil – filled with a small amount of healthy unsaturated fat – the way nature intended us to eat fat, packaged with fibre and phytonutrients. Canada’s food guide is being revamped, I just gave my input, and was pleased to see they recommend we limit saturated fats and instead choose unsaturated fats. Good news! Olives cause your brain to signal “yup, we are satisfied and full here!” You get that mouth oil feeling, olives curb cravings. See my article, How to Eat Vegan For Energy and Weight Loss I talk about the proportions of beans, greens, veggies and starches to eat to keep up your energy and lose weight! Tip: eat this salad on a bed of spinach or other dark greens, if you want to feel extra energy. This salad is a meal, a 15 minute vegan fat-free plant-based protein pasta salad dinner! Black olives, cucumber, whole grain rotini pasta, frozen peas, corn, tomatoes, green onions plus Italian seasonings and lemon juice make an extraordinary delicious high fibre FRESH healthy pasta salad. Assemble the vegetables - including the frozen ones - add the drained pasta, stir and the temperature will become perfect to serve. The peas will melt, even cook a bit, the pasta will cool, it's awesomely fast. We are always surprised by how tasty this simple combination is. It's just perfect. Kids love the sweet peas, salty seasonings, and the pasta! 398 ml black olives pitted canned, whole, no-oil, add a splash of olive juice to the salad, then drain the rest. 6 tbsp lemon juice fresh squeezed for vitamin C if you can! Heat water for pasta. We like whole grain rotini for this, the rotini shape holds the seasoning well and doesn't get soggy as leftovers. Once water is boiling, add the pasta, stir. Cook to be firm - al dente, following package directions, don't overcook. While the water heats, dice the cucumber, tomatoes, green onions and add to an extra large bowl. Open the cans of black beans, corn (if using canned) and black olives. Add corn with it's juice (max 1/3 cup) to the bowl, I like to splash some of the black olive juice into the salad bowl too. If you are using frozen corn it will create some juice when it hits the hot pasta, so don't worry. Add the drained black beans and olives. Add frozen peas - it is important that they are frozen at this point because they cool the pasta. Add seasonings and lemon juice to a small bowl or measuring cup, stir to combine, taste test and adjust to your preference, pour over salad, and stir through. Once pasta is done, drain pasta well, while it is still hot add the pasta to the vegetables and dressing. Stir to combine. Wait a couple minutes for the herbs to release their flavours, and serve! Sub herbs for a dried Italian seasoning purchased mix. Store mixes usually contain salt, so don't add any extra salt. Read the label, choose a mix that doesn't contain added oils. Sub cucumber for orange and yellow peppers, zucchini, or romaine lettuce. As long as you keep the peas, corn, tomatoes and olives other vegetables work well. Omit the Pasta: This tastes great without the pasta as well, as a bean salad, serve with toast, pitas, or rice, or just with spinach. Vinegar: I'm curious if a vinegar would make this even nicer. Afraid to try, because my kids aren't into vinegar much yet and we've got something here that works. If anyone tries adding vinegar, please let me know!! Personally, I'd use a balsamic. People think you need to coat oven fries in oil, but they don’t know… try this recipe and you will learn better. Moisture leaves the sweet potatoes as they bake, and activates the seasonings. Your fries will be crispy, oil-free, and full of flavour. I recommend Epicure seasoning mixes, I used this Cajun spice to make mine tonight. It was spicy! Epicure seasonings are amazing high quality spices, with high nutritional value, and no artificial ingredients like MSG or gluten fillers. If you are in Canada, you can conveniently order spices and seasoning mixes from my Epicure site online catalogue and ship them to your home. My kids had no seasonings, they dipped their fries in ketchup. You can also use whatever spice blends you have around the house, like chili powder, or salt and pepper and garlic powder. Back to oil – One gram of oil is 9 calories… empty, empty, harmful calories. 13.6 grams of oil (a tablespoon) is 120 calories. One serving of these sweet potatoes without oil is only 89 calories! When you add oil, you are adding calories that are nutrition poor. You do not need processed oil to live. We have been cooking oil-free since 2013. If you think you need it…. what is something bad that happens to people who don’t eat oil? Skip the oil. Why no-oil cooking? Sweet potatoes have many health benefits, they are a super-food. Like what benefits? Well, much of the following information was conveniently provided on a paper that came with my bag of 6 sweet potatoes – let’s learn together, ok? Sweet potatoes are a good source of dietary fiber, which lowers your risk for constipation, diverticulitis, colon and rectal cancer, heart disease, type two diabetes and obesity. The fibre in sweet potatoes provides a feeling of fulness and satisfaction, which makes you eat less! Antioxidants play a role in the prevention of heart disease and cancer, and sweet potatoes supply plenty of the antioxidants vitamin E, and beta-carotene. Antioxidants are essential for good brain functioning and delay the effects of ageing on the brain. Vitamin E is found mainly in high fat foods such as oils, nuts, and avocados. Only sweet potatoes provide vitamin E without fat and calories. One serving of this recipe is 285% of the vitamin A required for a person following a 2000 calorie diet. BAM! If you are short like me that is like 400% vitamin A… I don’t count calories, but I know from before I went vegan (when I stressed about calories ALL THE TIME) that I need about 1100 – 1200 calories a day to maintain my 5’2″ frame. Now that I eat whole-foods plant-based I don’t need to stress…. if I notice I’m getting some extra flab, I eat more greens and it goes away. Serious. A low glycemic index is desirable and is characterized by slow absorption, a modest rise in blood glucose, and smooth return to normal. This is especially important for people with diabetes, whose good health is dependent upon stable blood glucose levels. Diabetics and others wanting to avoid glucose highs and lows can turn to sweet potatoes, which have a low glycemic index. Potassium plays a major role in maintaining fluid and electrolyte balance and cell integrity. Fresh fruits and vegetables are the best sources of potassium, and sweet potatoes are among the top three richest sources. Naturally low in calories and high in nutritional value. Some ideas for using these nummy, nummy fries that you can consider while they are baking, or while you are peeling and chopping them. You can even eat raw sweet potato fries with your favourite dip (I read this on the sweet potato marketing literature that came with them, I have never actually tried this). Eat sweet potato fries for vegan breakfast with scrambled tofu and pancakes. Let’s dig into some sweet sweet potato fries! Don't buy frozen fries, make them fresh, and use orange sweet potatoes to get more antioxidants, potassium, and fibre, from a fat-free, low-glycemic index super-food! Peel the potatoes, cut into sticks, spread on your baking sheet, sprinkle with seasonings, bake, enjoy. See full instructions and pictures here! Preheat oven to 425° F. Use a foil or silicone lined baking sheet or stoneware. No-oil required. Cut in half or quarters, place on the round side, slice down 2-3 times to make 1 inch lengths. Set in a pile on the flat side, cut into sticks. Sprinkle with seasonings like seasoned salt, chili powder, or cajun seasoning from Epicure. If you have a convection oven, then fire up two sheets and cook those babies at the same time. Bake for 30 - 40 minutes. Remove if fries start to burn. Serve! In this case we had them with beet greens (with fresh squeezed lemon) and vegan chicken fingers. It was honestly a great combo. Spicy cajun fries, salty lemon beet greens (they are naturally salty), sweet ketchup veggie fingers - it was all really good, and pretty good for us too, right? With Ketchup mixed with cajun seasoning, or cranberry sauce, or lemon juice. This whole-foods plant-based, fat-free, no-oil healthy brussels sprouts with lentils and quinoa recipe is crazy easy. The quinoa and lentil pilaf in one pot is a delicious staple that can serve as a vegan starch and protein base for many of your meals. Here, I’ve added my orange thyme dressing, but other vegetables and sauces will work well too. Cook dry sprouted lentils and dry quinoa together, in the same pot, they take the same amount of time – and in 15 – 20 minutes you’ll have a pilaf of lentils and quinoa that is fluffy and ready for a vegetable and a sauce. You can dress the quinoa and lentils up in so many ways. Cook a huge batch of brussels sprouts for this, they go perfectly. The lentils and quinoa are going to be pretty boring on their own, but look through the sauces/dressings on this site and pick one and it becomes a different dish each time. I recommend my Sweet Zing Orange Thyme Dressing. You can click on the “sauce” tag in the sidebar to view a list of sauces. Or use the search feature on the site and search for “sauce” or “dressing”. Mmmm, just looking at these pictures again now, I remember how good this was! 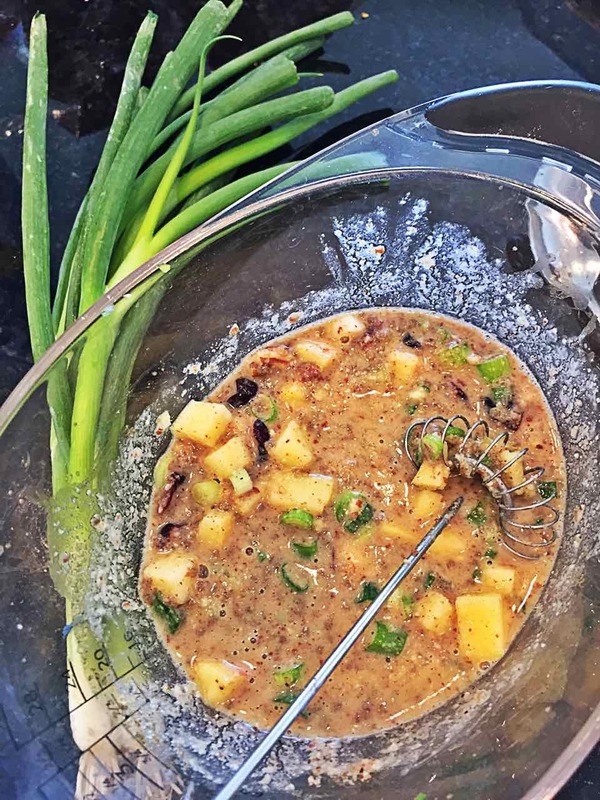 The sauce has a lot of tasty ingredients – orange juice, diced apple, sesame paste (tahini), green onions, chia seeds, dried cranberries… it’s great. Very quick, easy and simple to make too. 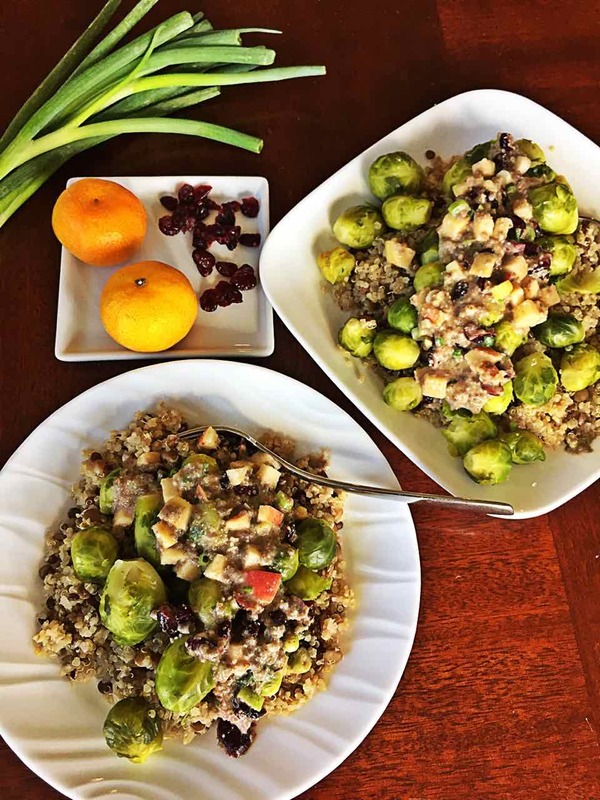 My kids liked the pilaf and brussels sprouts without the sauce, instead of the dressing, one added lemon juice, the other loads of cranberry sauce from a can. When I eat beans and rice, or lentils with quinoa I feel like I am living harmoniously with our planet, and usually surprised at how great they taste, and how satisfied I feel after. I hope at least someone else can relate to what I am talking about. 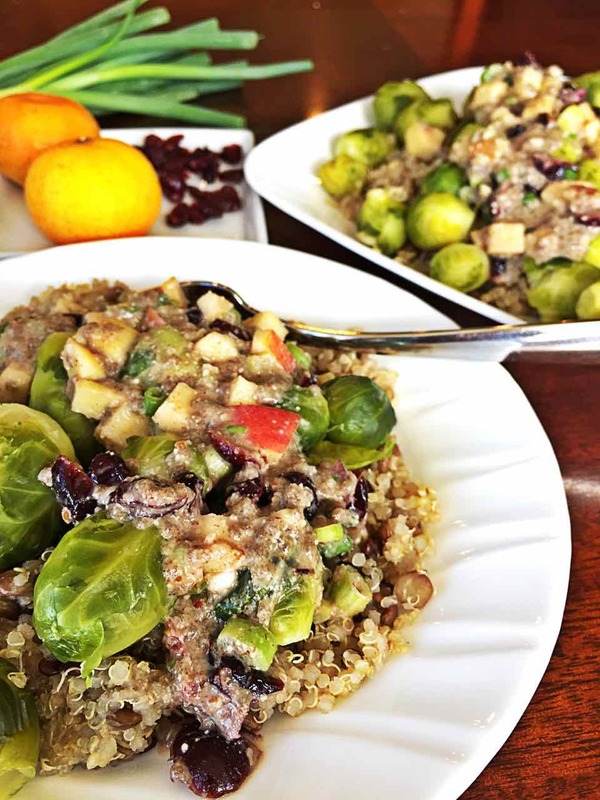 Cook sprouted lentils and quinoa in the same pot in 15 minutes, add brussels sprouts, a sweet tangy orange, apple, cranberry sauce and it's a beautiful meal. My husband and I aim to eat at least 1/2 - 1 cup of beans/legumes a day each and between 1/4 cup and 1/2 cup for each of our kids. This recipe will produce more lentils than quinoa so that your meal can be bean strong. Beans are an excellent carb - because they contain both carbs and protein and so many important nutrients. Feel confident eating beans - they are going to make you so strong and give you energy! 1 1/2 cups dried lentils sprouted lentils because they cook fastest, read the packages, select the fast cooking lentils. Orange Thyme Dressing recipe prepared, consider doubling the recipe to have enough for leftovers. One recipe makes 4 servings. Heat water in a medium sized pot, on high. Add quinoa and sprouted lentils, stir. Usually the water doesn't need to be boiling, check your instructions. Follow package directions about rinsing, some brands require rinsing to remove bitterness or dirt or pesticides. I often forget, hoping a reminder here helps you remember. Here are the brands I used - both were available at Costco, other brands will work, check that the cooking time on the lentils is similar to the quinoa - about 15 minutes. It seems that sprouted lentils usually cook faster than non-sprouted lentils. My sprouted lentils say simmer for 8 minutes then let sit for 4 minutes. My quinoa says simmer for 15 minutes. I like lentils soft rather than chewy so I am happy to cook the lentils a little longer. Once boiling, stir, reduce heat to low, cover and simmer for 15 minutes or according to package directions. If your lentils are going to take longer, then start them first and add the quinoa when there is 15 minutes cooking time left. Meanwhile, steam brussels sprouts in a steamer pot on the stove (makes them so juicy and tender, mmmm my favourite way) or in a microwave steamer like this large Epicure silicone steamer. You could also boil them in water, which is what I did this time. Any of these methods takes about 15 minutes. Now prepare the sauce - the fat-free no-oil Orange Thyme Dressing for example. It's going to take you 10 minutes. Once the pilaf is done, stir it to combine, it should be fluffy with no moisture. If there is water left, keep it on low for 5 minutes at a time until it is dried out, and reduce the water amount in the future. The lentils spread around the edge with the quinoa in the centre during cooking. The pilaf should look like this once done. Serve the pilaf, with brussels sprouts and a generous portion of sauce. Sometimes my pilaf takes longer to cook - closer to 25 minutes, even though the bags said 15. I probably use a slightly different temperature, or measuring cups. I just keep cooking it until it is dry, and it always comes out fine. Our family loves fruit crisps and fruit crumbles, they are naturally vegan, and easy to make oil-free. Here, I used almond flour and ground cashew nuts in the crumble topping. It tastes decadent. Lemon juice is a perfect binder, it makes the topping clump together and become crumbly, crispy, and tasty fruit topping. You can use this wfpb topping for apple crisp, berry crisp, or other fruits too. I just made a crabapple crumble with it, I swapped apple pie spice for the ginger. Tastes great. In this recipe, I added ginger – it is lovely with pears, and did you know studies found ginger is a very effective pain-killer? Especially for migraine headaches and menstrual cramps. A teaspoon a day of ginger powder does the trick, takes the pain away plus tastes great added to tea. This book has a great deal of science based information about foods that have been proven to prevent and reverse disease. And enjoy pears in this delicious homemade dessert or snack! This whole-foods plant-based oil-free pear crisp recipe is incredibly simple to make, and very tasty. The crumble remains crisp, not soggy, it is pleasurable to eat slightly crunchy topping with the soft pears. Different varieties of pears have different flavors and textures, each could lead to an entirely different finished pear crumble. For this recipe, I used Packham Pears from Australia. They are green and hard, and don't seem to ripen much, so I thought they would be great for baking. Pears are naturally sweet and transform into a decadent and delicious dessert without much added sugar. 7 pears Green Packham or other firm variety, peeled and chopped into 1-inch chunks or thin slices. Peel and chop pears into evenly sized cubes, or thin slices. I pushed a slicer through each pear to make 6 pieces, then cut each piece in half lengthwise. Place pears into a 9x13 baking dish. In a small bowl mix cornstarch, ground ginger, salt, and coconut sugar until well combined and lump free. Sprinkle evenly over the pears. In a food processor, on high speed, blend oats, coconut sugar, almond flour, cashews, ground ginger, cinnamon and salt. Once the cashews are finely ground, while processing, slowly add the lemon juice to make the mixture crumbly. Do not over process, or the mixture will form into balls. Spread oat topping crumble over the pears. Bake for 30-40 minutes. The crisp is done when the fruit is bubbling and the topping is light brown in the center. You can opt to brown the top by broiling on low for 3 minutes, I didn't.